Pilgrimage is unpredictable. You leave home with an idea in your mind of what your heart is longing to see, where you expect to have your most meaningful moments. God laughs and gives what He knows you need. I spoke of this trip as going to Jerusalem. Among other reasons, that was why I was so intent on joining the group on time. The trip began in Jerusalem. As it happened, there was unpredictable violence and with a (welcome) excess of caution, our tour company changed the itinerary to avoid the Old City in those first days. I missed Ain Karim (where Mary and Elisabeth met), the Mount of Olives (which they only drove around but did not walk through), and Gethsemene. Important places for sure, but in the whole flow of the pilgrimage, I don’t feel deprived. Also because of the random acts of violence in the country, we exchanged one night in Jerusalem for an extra day in Galilee. Which, as it turned out, was God’s perfect plan. Jerusalem has been profound, but Galilee is my home with Jesus. 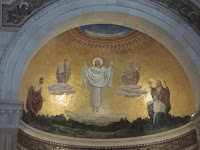 The man that was Jesus had shown his pure form. 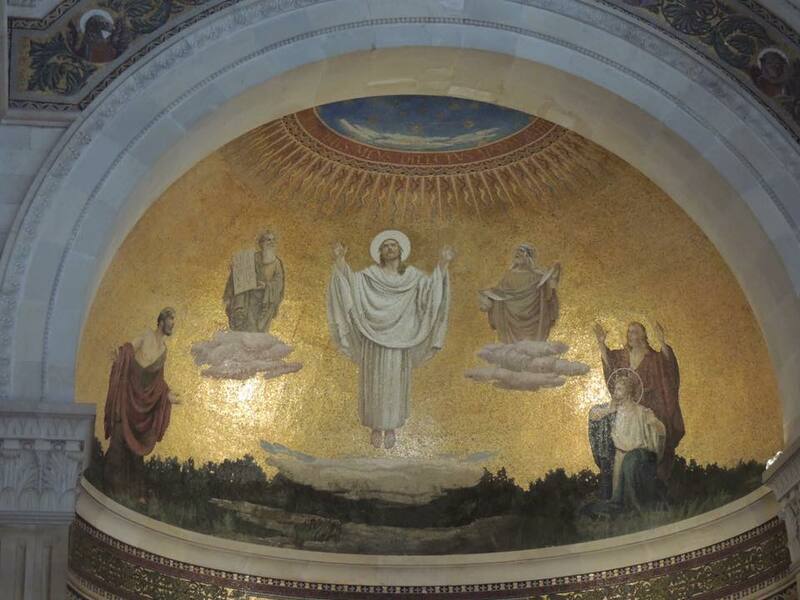 Upon a high mountain he stood, transfigured in light. That his chosen might see that he was the Christ. Ah, hope of all hope! Ah, joy of all joy! Toward Thee we aspire, who believe in Thy word. As you would expect, all through Israel there are mobs of pilgrims from all countries and denominations. The final ascent up Mount Tabor is a switch-back road, too winding for the buses, so you stop at a taxi stand and wait till a mini-bus can take you up. Arriving at the top of the hill we were listening to the Mass in several languages as well as the general hubbub of so many visitors. We’ve grown used to it and are getting good at tuning it out. We luckily found a quiet spot on the outside of the church, where we could sing the appropriate songs and hear our own voices. After the singing, the group went off to have a Purification Ceremony, but it was my moment and I sat against the wall, in a deep, immoveable silence. The site closes from noon to four, and as we approached the noon hour, the hilltop vacated till our group was virtually alone. At every site there is at least one, often multiple churches (different denominations). The churches themselves (to me) are usually not of interest. Meditating in or outside of them is more a question of convenience or quiet than beauty or vibrations. Not so on the Mount of Transfiguration. The architecture was guided by the spirit of Christ. It is an enormous structure, but so elegant in its design and decoration that it gave even more inspiration to the experience. In various places there were glass panels on the floor revealing the bedrock underneath where, presumably, Jesus stood with his disciples at the moment of divine revelation. Finally, it was going to be lunch hour for the taxi drivers and we had to take the last ride down the hill. Reluctantly, so reluctantly, we left. From Mt. Tabor we went to Nazareth, where the angel appeared to Mary and told her she would be the mother of Jesus. Father, Mother, both are one. Mother, bring us peace again! Hints of Thy love for all the earth. Who announced the will of the Lord. Through Mary, the light descended. O God of peace! O God of Joy! May our souls find their freedom in Thee! 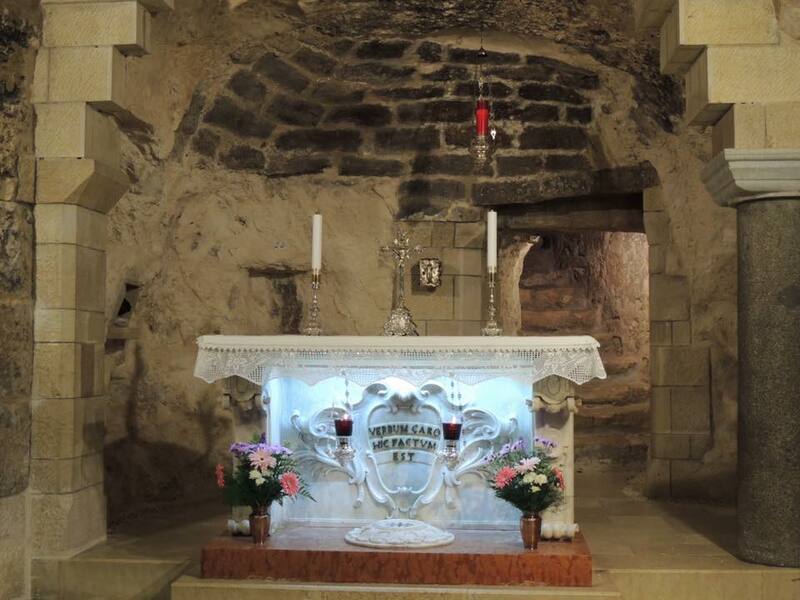 The church is built over a stone dwelling, a converted cave, which is believed to be the house where Mary lived and where the angel spoke to her. Still, the site of Mary’s simple home and the realization of what a profound event took place on that site transcended all other considerations and sweet silence existed inwardly in the midst of everything. Our last day in Galilee we again went out on the water before dawn. There was no mist and we had an unobstructed view of the brilliant orb of the sun coming over the hills surrounding the lake, its rays streaking out over the water, as if reaching out to bless us in the boat as we silently watched (and inwardly applauded) Divine Mother’s show. 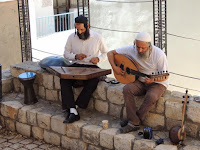 We were heading back to Jerusalem with two stops along the way. First in Tzfat (also spelled Zafed, Safed), the home for centuries of mystical Judaism. Some time ago enlightened rabbis settled there and over the years it has become the center in Israel for the study of the Kabbalah. It is also an artists colony. Altogether very interesting. Our guide, Marty — an enthusiastic, giving, highly knowledgeable man — took us to meet a particular artist/teacher. Like so many Israelis, this man was born in America and emigrated later. He gave us a fascinating introductory class on the Kabbalah, illustrated with some of the many mandala-like pieces of art he has created. Beautiful art. Wise and loving man. Fascinating subject. It helped all of us to feel more clear about the ancient and present reality of Judaism. A little time to wander through the shopping area — filled with lovely artistic pieces. Feast for the heart and for the eyes. Marty is very knowledgeable about the history of Israel and how it links to the Old Testament. 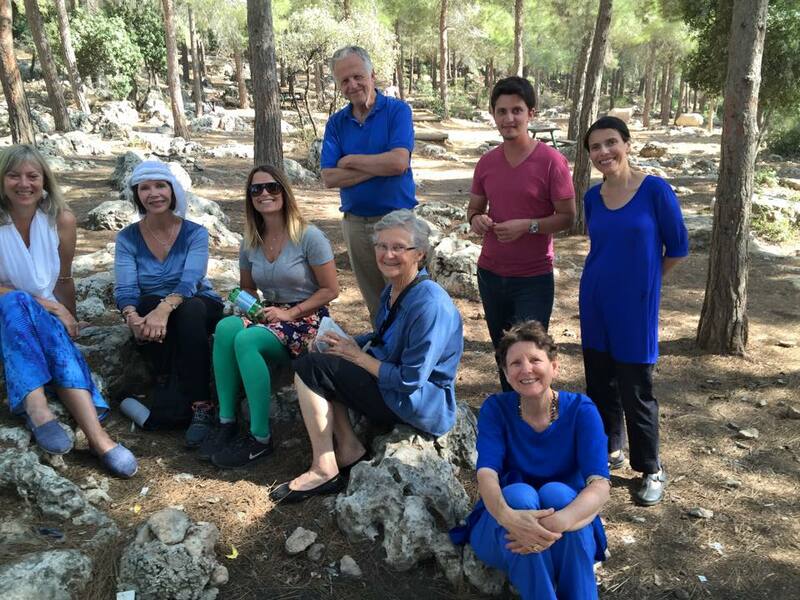 This country gives a whole new perspective on the word “old.” We visited an archeological site called Meggido. This is a hilltop near a key canyon on a critical road through the country. It is mentioned in the Bible several times as well as other historical texts. Archeologists have uncovered 24 different distinct cities all built on the same strategic hill. I’m not much for piles of old rocks, but this was truly impressive! Once we reach the human level, Master tells us, we have the freedom to wander in delusion for as long as we choose. Not that all 24 of those cities were built by the same souls but one can well imagine a cycle of defeat and revenge and victory and defeat being acted out through reincarnation quite a few times before the soul is ready to move on. By the way, some of you may not have remembered that “You Remain Our Friend” was inspired by Swamiji’s visit to the Holy Sepulcher (the place where Jesus was crucified). Swamiji says that “When praying for a melody that would express, for me, the mood of Christ’s crucifixion, I concentrated on compassion, and on unconditional love.” It makes it ideal for weekly reaffirmation of our relationship with God and God’s relationship with us. Our guide is an observant Jew. Which means from sundown on Friday till sundown on Saturday, among other things, he doesn’t use any mechanical devices. He doesn’t use a car or a bus, but only goes places that he can walk to. We were happy to have a religious person as a guide and accommodated our schedule to his needs. Which meant that we went into the old city — within walking distance of our hotel — on our second day in the city, so that Marty could go with us. The first day we used the bus and went to the Museum of Israel. I am not big on museums but on pilgrimage part of the sadhana is to say an enthusiastic “yes” to whatever God brings. Fortunately, He knows better than me. This is one of the premier museums in the world — and well-deserves its reputation. To begin with, they have “immortalized their ideals in architecture.” It is beautifully laid out and every exhibit is exquisite. Only the best is on display and everything is perfectly displayed. They have all kinds of collections, so I’ll just mention a few. The Dead Sea Scrolls (or copies) are on display. The building in which you view them is designed to match the clay pot in which the scrolls were found. On an immense scale, of course. But when you look up from the fascinating exhibits you are inside a clay pot, with a rising curving roof and the circular pattern of how the clay was formed. And downstairs you are inside a cave where the pots were discovered. Here also there is a scale model of Jerusalem as it is presumed to have been at the time of Jesus. The son of a wealthy man was killed during the war of Independence in 1948 and the father built this model as a memorial to his son. Every building is made out of stone, laid out across a large hill outside, at a scale (I think) of 1:50. So before we went into the Old City, we got a view of how it had been before. Most impressive was the immensity of the Temple that was there at the time of Jesus. You could see why the sincere devotees of that time attracted to them one who would reform and renew their faith. The mere size of the Temple compound spoke so much about worldly power and wealth. Oh my. Quite a contrast to the simple “love God, be ye like little children” message of Jesus. There is a reason why some art is revered through the ages. This is one of those pieces. This was not the final imprisonment for Peter, but the time he was miraculously freed by angels. 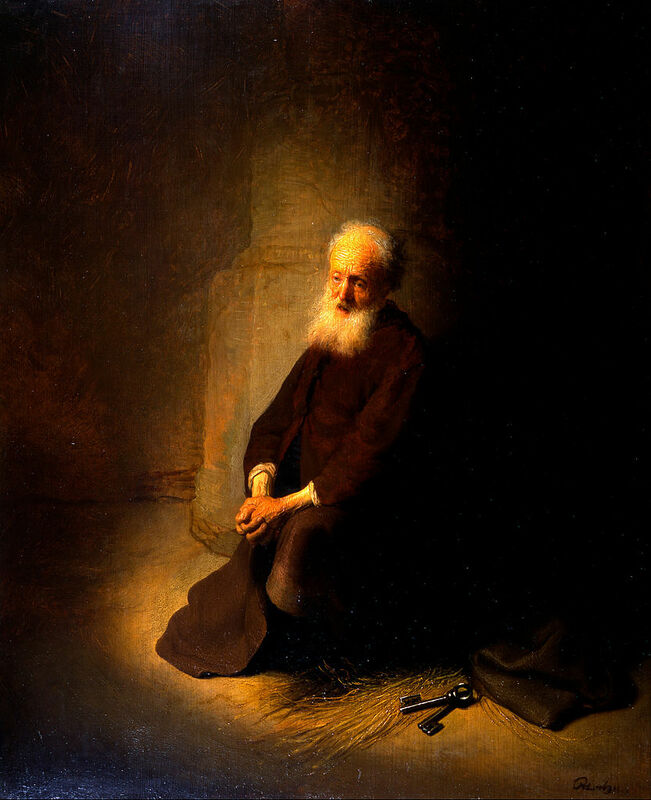 But before he was freed, when he didn’t know the miracle was coming. You can look the painting up on the internet. Even there you can see what an exquisite piece of art it is. And these were just two pieces in an immense warren of galleries. In the afternoon of that day we went out into a nearby woods and made pita bread over an open fire which we consumed with olive oil, an herbal mix of sesame seed and hyssop, and, for a total change of pace, Nutella if you preferred. Child-like fun. Friday night we were invited to the home of a family in Jerusalem to celebrate the Sabbath. It is an American couple, Hillel and Chaya, who founded and run the Sheval Center. They are also transplanted Americans. He is an orthodox rabbi and she is a writer and artist. They are both therapists and are pioneering a style of Jewish life that is orthodox in its beliefs and practices but speaks also to the needs of the time. Every Friday evening they have tourists groups from all over the world into their home to share the Sabbath dinner, prayers, songs. Having grown up with some of these rituals I admit I wasn’t all that interested in this event, but saying “yes” (and meaning it with one’s whole heart) is pilgrimage, so I was happily present for what turned out to be a deeply touching evening. They have four children. The oldest are 8-year old twins. The children had already gone to bed so we only met the baby at the end, who woke up and demanded the attention of his parents. As it happened, this baby boy, Levi, probably ranks in the top ten all time cutest babies. Our hearts were already wide open and he just marched right in! It was the sabbath, however, and no electronic devices could be used, so no pictures. Hillel and Chaya have chosen to bring light where light is desperately needed, living and doing their work in Jerusalem. They combine their therapy practice with the kinds of activities we also offer — groups for men and women, meditation, yoga practice. Pray for their work. They are kindred spirits. Part of the great ring of light-workers around the globe. Through Marty we had come to know much about modern Israel and present-day Judaism, but this brought it all to a clearer, heartfelt focus. Saturday we went into the Old City. We started just outside the walls, in a replica of the room where the Last Supper was held. It was filled with very loud pilgrims and I found it without inspiration. Right nearby was the tomb of David. It is considered a synagogue, and this was the sabbath, so no electronics could be used, i.e., no pictures. The small room is partitioned into separate sections for men and women. It was delightfully cool and silent and meditation was deep and effortless. From there we went to the Church of the Holy Sepulcher. Which was neither cool nor silent, but jammed with noisy pilgrims. It is a huge church built over the last few stations of the cross. It includes where Jesus was crowned with thorns, crucified, taken from the cross and laid on a stone, anointed there with herbs and oils and then placed in the stone tomb where he lay for three days until the Resurrection. Naturally, every Christian coming to Israel wants to come to this place. The lines to touch the stone upon which the cross stood, and the tomb where his body was laid were too long, too noisy and too restless for me even to consider. I found a spot nearby. Fortunately, spirit is stronger than the restless human mind, and it was deep and still. Later I also sat by the stone where his body was laid. Impossible to get close to the tomb, so I leave that for another time. That whole spot, of course, was vibrant with the presence of Christ but for me where Christ lives in the Holy Land was in Galilee. We went into the Old City for lunch in the Armenian Quarter. The next day we went to the Western Wall, at the base of Temple Mount, where the Temple stood where Jesus preached and faced down his critics. Where he drove out the money changers and so many of the dramatic incidents of his life took place. The Mount itself is a Moslem site and our guide suggested we not go there at all. 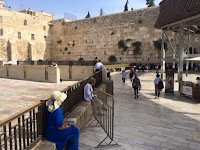 So as close as we got was the Western Wall, where Jews come from all over the world to pray and to press into the cracks in the rock written prayers. Impossible not to be moved by so much devotion, ancient and now. What made an even deeper impression on me was a part of the Western Wall that is an archeological site. They have excavated down to the paving stones of the Roman world, the level of ground on which Jesus walked, which is considerably lower than ground level at the prayer section. Massive doesn’t begin to describe it! Stones, immense in themselves, piled one on top of another going many many many feet into the air. Earlier we had walked through a district where our guide explained lavish mansions had been uncovered — which were inhabited by the temple priests! Power and money. Those delusions have tempted man forever. The conflict between the message of Jesus and the establishment of the religion of his day was so obvious. Jerusalem was where Jesus fought to bring light into darkness. I could understand why he wept as he looked over the city. Wept because of the unwillingness of so many to see what he had to bring them. The drama of Jerusalem, the sheer power of Jesus’ triumph is thrilling. For me though, Galilee, with “his chosen few” where “they sang with him and worshipped the Lord,” was my heart-place in the Holy Land.. This has been a profound and joyous journey. Every minute of it. And I am ready to come back to life as it has been given to me in this incarnation.